it seems that he remembers me. 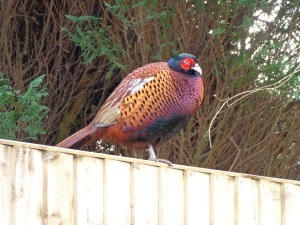 Last winter, you may remember, I had a pheasant regularly visiting my garden and he became moderately friendly. Eventually he was joined by another, although the two didn’t seem to enjoy each other’s company! Eventually, as the weather got warmer they stopped visiting and I haven’t seen them since, but yesterday one turned up in my garden and as he again seems fairly tame I feel confident in believing that he is one of last year’s visitors. He approached me when I appeared bearing food and had no hesitation in feeding from the same bowl I used to feed him last year. 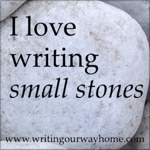 A while back I reported that we had a pheasant visit our garden (you can read about it here). Since then he has regularly visited and I have been feeding him. Now he comes and taps on the French Window when he wants food. He doesn’t appear everyday and I know several other people have reported seeing him in the neighbourhood so he is obviously exploring food potential in other gardens. 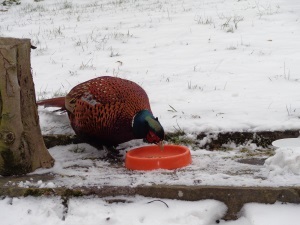 The picture below shows him feeding in the snow a few days ago. He is gradually getting more tame and now walks towards me when putting food out rather than retiring to a safe distance. A few weeks after his first visit a second pheasant turned up. This one is smaller and seems older. They had a bit of a barney for an hour or so then I noticed them fly off, the original pheasant chasing the other. Eventually the first pheasant returned, presumably victorious at having sent his rival packing. We hadn’t seen this second pheasant since – until yesterday. Our recent snowfall had turned to rain and was slowly washing the snow away. 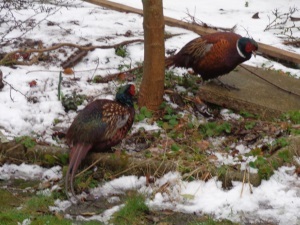 We noticed the second pheasant in the garden looking very soggy and sorry for himself. He seemed very dozy and we were a bit worried about him. He greedily gobbled up the food I put out and a short while later was asking for more, which was also greedily gobbled up. Then the first pheasant also showed up and the pair of them dodged around each other, marking each other’s movements for quite some considerable time, the smaller pheasant not giving ground. 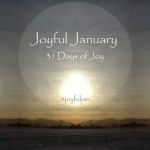 This built up to another fluttering challenge, until finally I noticed that Pheasant No. 1 – the bigger one and furthest from the camera in the photo – had gone again but the smaller one was still here, still looking dozy and unhappy. No. 2 hung about all day looking miserable but greedily gobbling up food as soon as we put it out. We fed him many times during the day until eventually, by mid-afternoon he was looking a whole lot better. Soon after that he also disappeared. This morning, however, he was back again, shouting to be fed. My husband went out in dressing gown and slippers to feed him first thing. He finished that off and was asking for more when I appeared a short while later fully dressed. Again he gobbled that up, running towards me when I filled the dish – though he came no closer than about 3ft away, just to be sure he was safe! A little later I saw him sitting on the fence and was able to get quite close to take this photo. He still seemed a bit dozy and had one foot tucked up underneath him for warmth. Shortly after I took this photo he disappeared again. The first pheasant hasn’t been around today at all. If you are wondering how I can tell the difference, well, as I said number 2 is smaller and seems older. He also has a larger silvery grey patches on his wings – perhaps a sign of age? 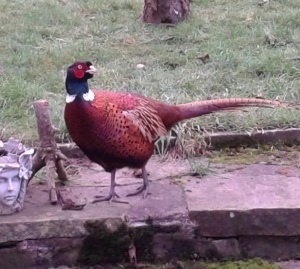 The first pheasant is bigger and more impressive, obviously in his prime. Today he seems content to leave our garden to his rival but will he back tomorrow? Will they both appear again? I don’t know, but at least they both know that if they do turn up they will get fed. 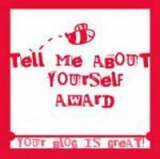 I posted this hurriedly on the ‘River’ Facebook page yesterday. I have polished it a tad to post here.